happy thanksgiving! love seeing all your great turkey leftovers ideas! Thu: Thanksgiving feast at my parent’s farm. Most of what I make is straight from this blog. Jane’s Thanksgiving recipes are the best! I think because they are “tried & true” family favorites. Crowd pleasers for years and years. I am making sweet potato souffle, roasted brussels sprouts, cranberry slush (big hit last year), and I just added Rose’s creamed onions. Fri: Turkey sandwiches for lunch (with miracle whip and a side of Good’s potato chips because that is my family tradition). Shrimp, goat cheese, cranberry, & pecan salad for dinner. awwwww, what kind sweet wonderful words, kim! thank you! I am SO happy that these recipes are favorites for your family. does my heart good! Fri: salad with turkey, grilled pineapple, grilled beats over greens with pineapple vinaigrette. what is “baseball”-cut of beef? 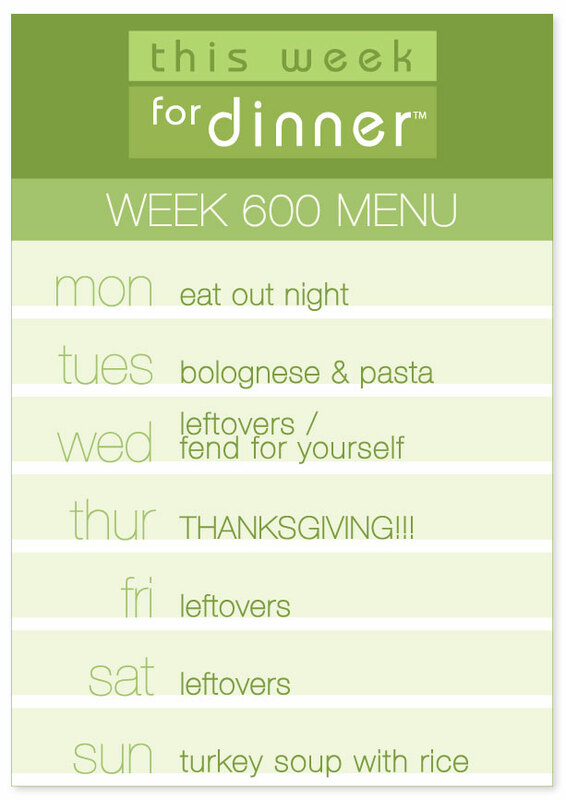 Congrats on the 600 menus! !